Learn how to support those in addiction recovery (and their loved ones) with a valuable resource for relapse prevention. Integrating the wisdom of yoga with the practical tools of 12-step methodology, Yoga of 12 Step Recovery provides a rich and powerful framework for reintegration with the self and with the world. Yoga of 12 Step Recovery (Y12SR) is an empirically-informed program, which combines the wisdom of yoga with the practical tools of 12 step programs to address the physical, mental, and spiritual elements of addiction. Y12SR trainings equip yoga teachers and other helping professionals with knowledge and resources to support anyone affected by addiction. To host Y12SR meetings, students must complete both the Y12SR Intensive and the Y12SR Leadership Training. The Y12SR Intensive is an introductory training, designed for anyone who wants to learn more about Yoga of 12-Step Recovery. The intensive explores how the ancient wisdom of yoga can work with the practical tools of 12 Step Programs to support addiction recovery. This training serves as step one of the two-part Y12SR certification process. 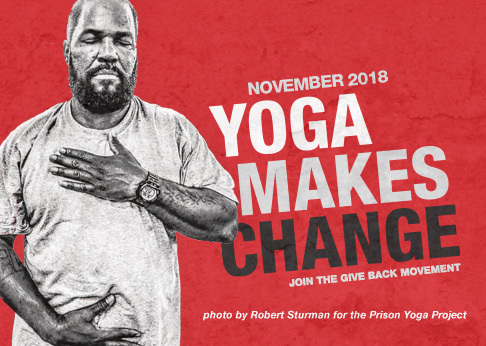 The Y12SR Leadership Training teaches yoga teachers and helping professionals how to host weekly Yoga of 12-Step Recovery classes in their communities. This training provides participants with a holistic framework for relapse prevention, and serves as step two of the two-part Y12SR certification process. 8 hours of CEUs are available through Yoga Alliance. The Y12SR Combined Training is a three-day training, which covers all of the material from the Y12SR Intensive and Leadership Training. Graduates of the combined trained are fully certified to lead Y12SR meetings. 24 hours of CEUs are available through Yoga Alliance. The Y12SR Breaking Barriers Workshop is designed for anyone who wants to go deeper into their personal journey of reintegration and empowerment. Combining lecture, discussion, experiential exercises, and yoga, the workshop examines the roots of codependency, “the addiction to look elsewhere,” and offers tools and practices for finding a lasting source of fulfillment. 12 hours of CEUs are available through Yoga Alliance. Y12SR weekend trainings offer 8 to 12 hours of instructional time. The Y12SR Online Intensive offers a condensed schedule of 6 hours of instructional time. Combined trainings, which give participants the opportunity to become fully certified to lead Y12SR meetings, are held over the course of three full days and provide 24 hours of instructional time. To view an up-to-date schedule of trainings, visit Y12SR.com. Registration begins at $180 for Y12SR’s introductory online intensives, and ranges up to $550 for the combined training. Pricing may vary for special workshops and intensives that offer more or less than the standard hours of instruction. Find a Yoga of 12 Step Recovery teacher training near you.